Presenters are faced with many challenges to their presentations, the biggest of which is a distracted audience. It’s not hard to be distracted, however, because people today have such shorter attention spans and are distracted by their mobile phones, primarily. 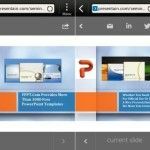 Therefore, presenters have to be extra creative, not only with their slideshows, but also with how they interact with their audience. 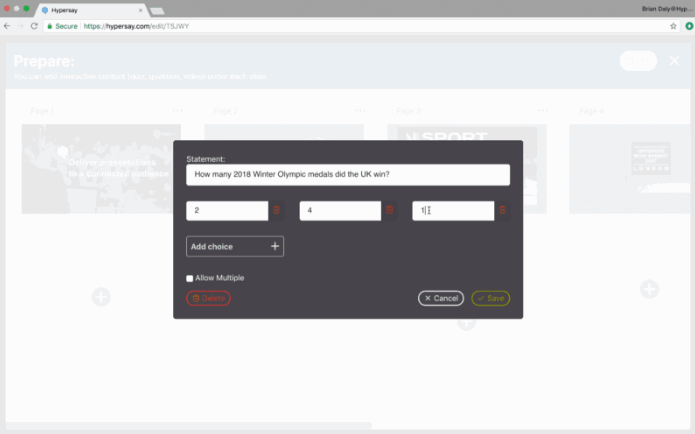 One of the best tools out there is Hypersay, which can help you create a more interactive presentation so you can ensure that your audience stays engaged. 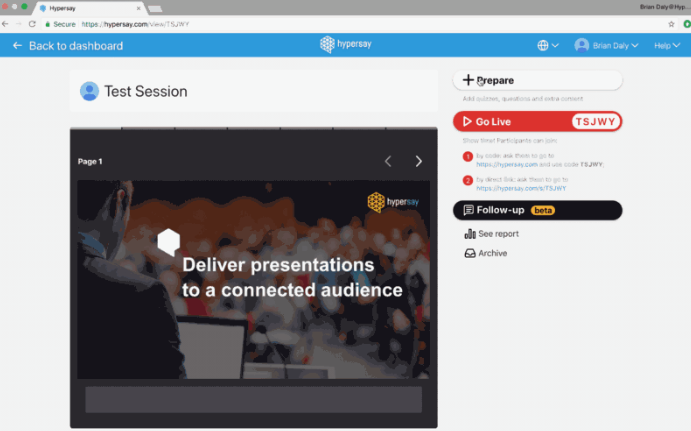 Hypersay is a platform that allows you to better interact with your audience and make your presentations more dynamic. 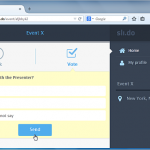 As a web app, it helps you create a Live-sharing session with your participant, and not just a simple traditional PowerPoint presentation where you talk and they listen. With Hypersay, you connect directly to your audience’s devices, such as smartphones, tablets, and laptops. From there, you can make them participate in your presentation by answering questions, completing quizzes, and asking questions as well. This way, instead of needlessly fiddling with their devices, they are actually taking part in your presentation. 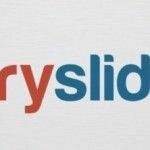 Hypersay, used by many in the business, educational, and personal improvement fields, is chock-full of features that can help every presenter give their best presentation every time. All you have to do is to register into Hypersay. 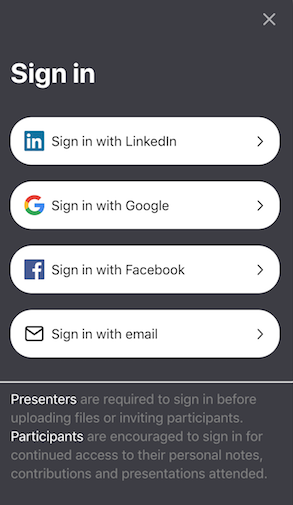 You have then to sign in before you upload your PowerPoint presentation or Google Slide. You may sign in with your email or LinkedIn account. 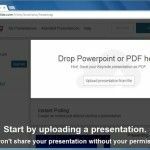 Once you have uploaded your presentation, this will be converted and you can then just add a title and short description to your presentation. 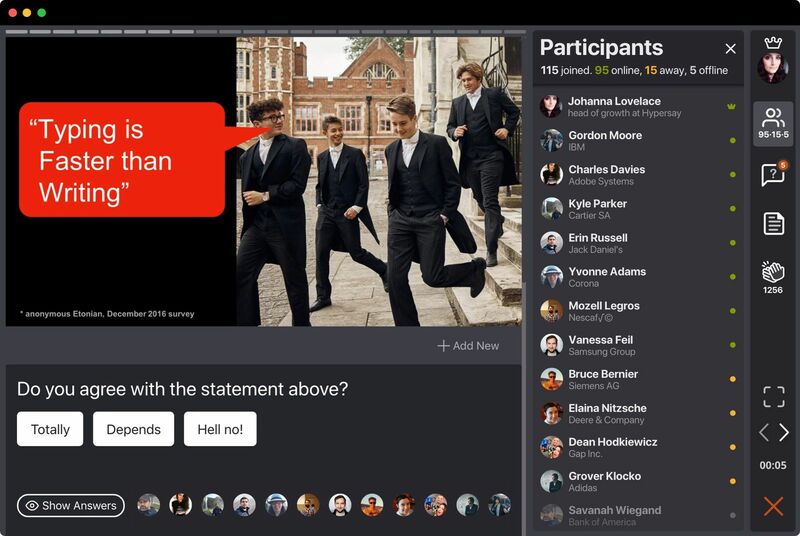 Hypersay helps you increase engagement by conducting a wide variety of Live activities, such as polls, quizzes, open questions, and many more. You can even have an audience Q&A wall, wherein you crowdsource questions that are then arranged by order by the number of votes the questions have. You can also share your presentation Live, as well as share interactive images that you can make your audience participate in using their own devices. One example is you can upload a puzzle image and you can make your audience complete the puzzle by dragging the pieces to the right place. Furthermore, your audience can also use Hypersay to create their own private notes about your presentation. 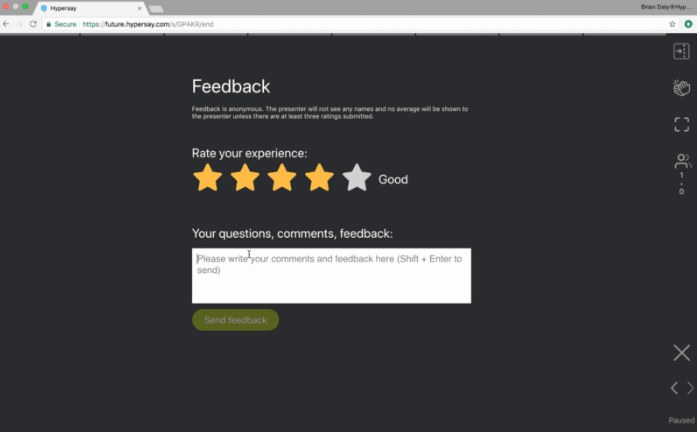 You, meanwhile, can also gather real time feedback at the end of your presentation, that is, if the claps you receive from your audience using Hypersay throughout the app is not enough. Aside from the Live session interactive boost that Hypersay provides, it also has features that help you prepare for your presentation. Aside from uploading your already existing deck, you can add more content and interactions. You can also change your slide order as well as switch your presentation to a different language such as French, Italian, Romanian, and so on. And when you’re done with your presentation, you can also follow up with your audience to check on what they have gathered or learned from the session. You also get a report on what went on during the whole session. Furthermore, you gain more insight about your session with analytics provided by Hypersay, which will soon be available. Hypersay is great not just for individuals but also for the enterprise, as it has private cloud and custom branding features.